October 17, 2015 was a great day! I wrote a poem and read it from the main stage. (Wow, that was an experience, sandwiched between children singing and dancing and very lovely ladies in their costumes dancing and clapping — I think the audience wasn’t quite sure what to make of me!) 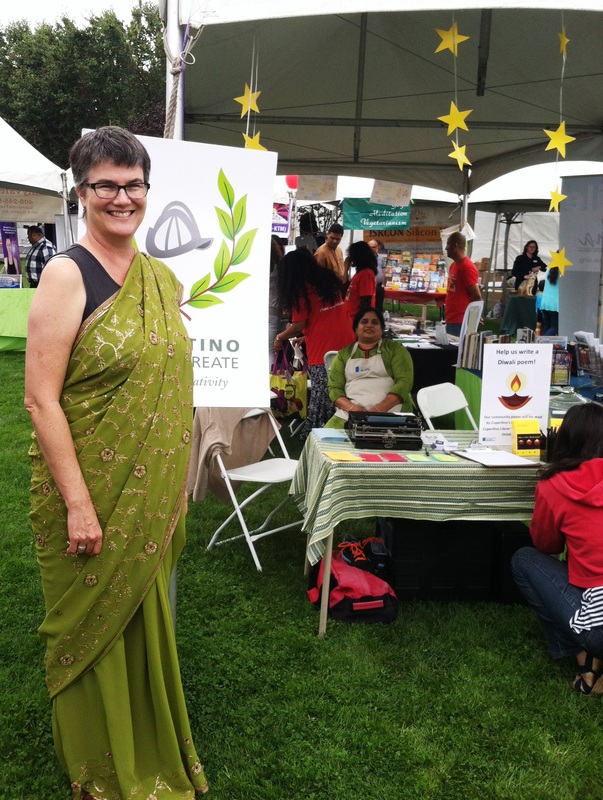 I would never have gotten the saree to stay on without the help of Janki Chokshi. 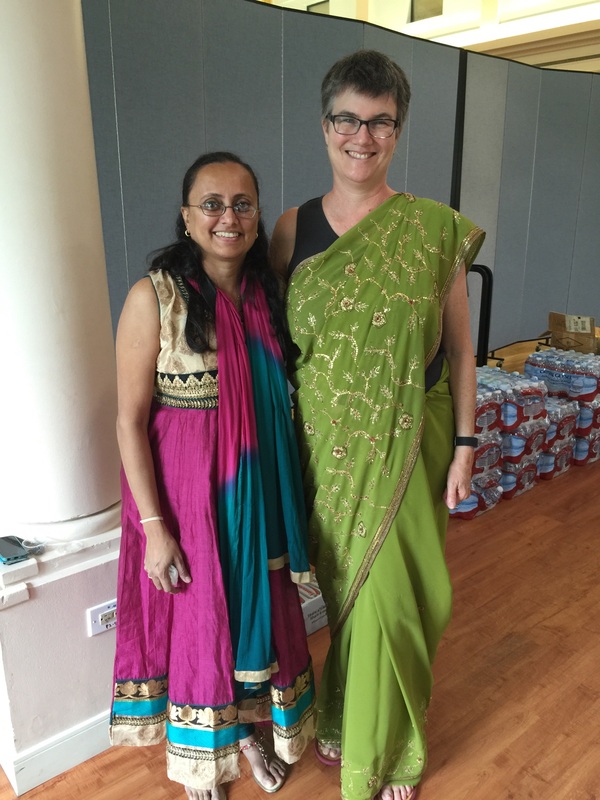 Janki and Jennifer in festive garb. 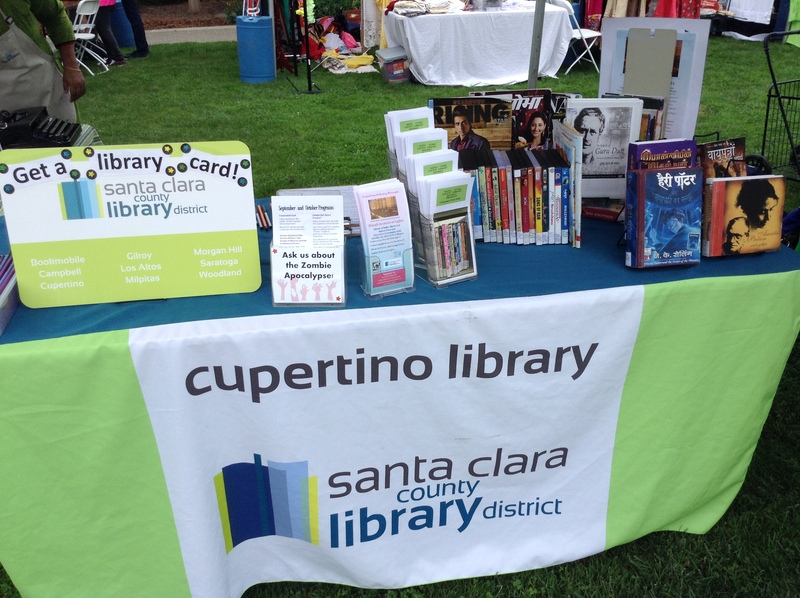 I spent the rest of the day hanging out with Clare Varisio and Godha Krishnan (librarians and awesome humans) at the Cupertino Library booth. Here are some photos of the general scene. Amanda Williamsen was with us for the morning. Clare took this photo — they were signing up people for library cards all day. Amanda, Godha and Clare in the booth early in the day. 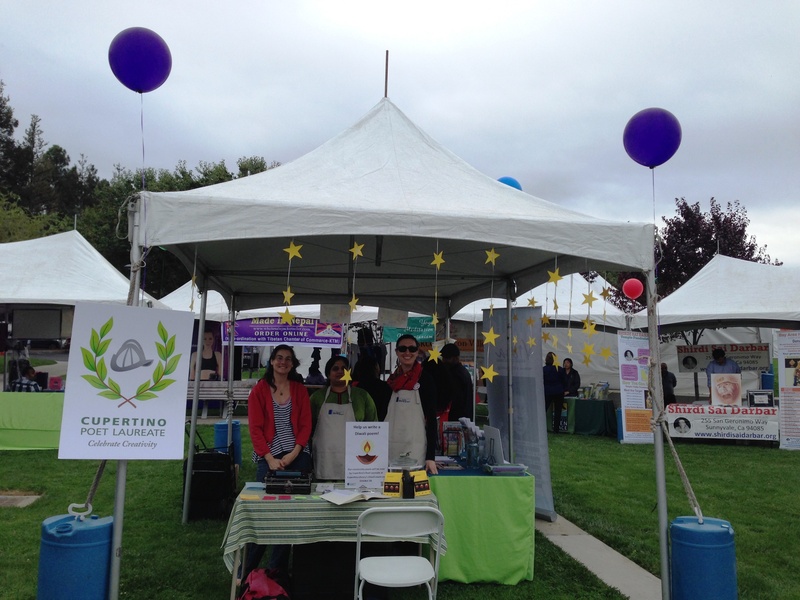 Amazing yellow stars gave the booth such charm. Just like the lights of Diwali fighting off the gloomy overcast day. Jennifer wearing the saree, her first time ever. 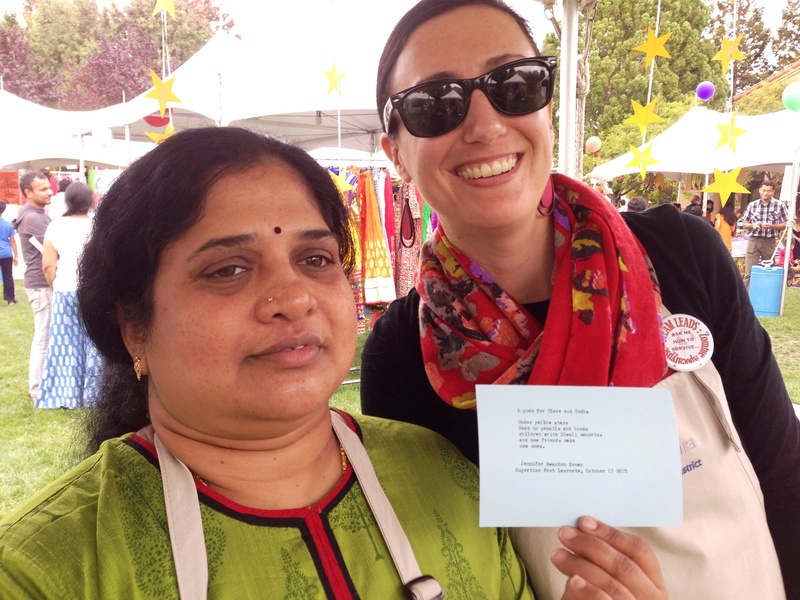 Godha and Clare, with the poem I wrote for them. I was typing poems on my typewriter, and this one is for the great new librarian friends I made. 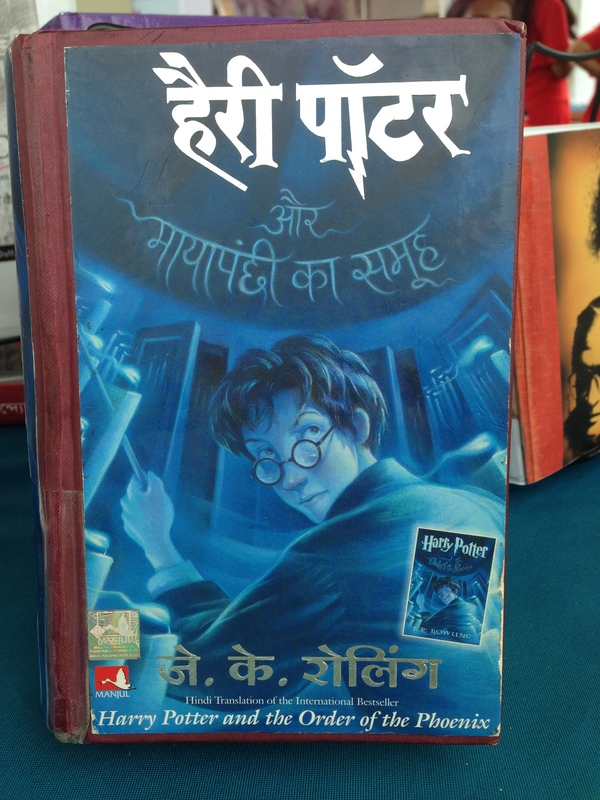 You can read Harry Potter in Hindi if you check the book out of the library! As the poet laureate, I had two activities going on. 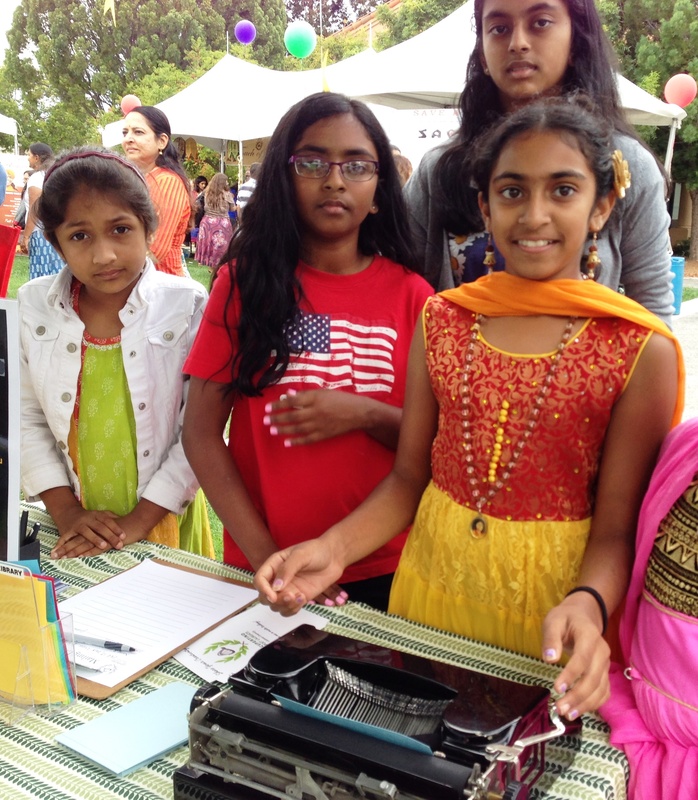 First, folks could come and check out my 1950s typewriter — and many many (many) kids tried it out. It’s hard to type on a machine like this if you’re used to an easy computer keyboard! 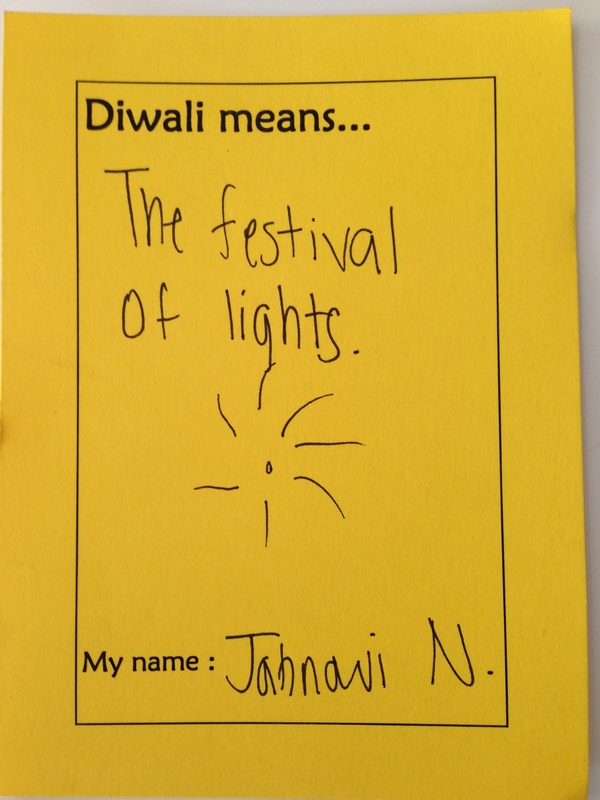 Secondly, Clare made great yellow cards with prompts “Diwali means…” and “On Diwali, I…” which anyone could write on. 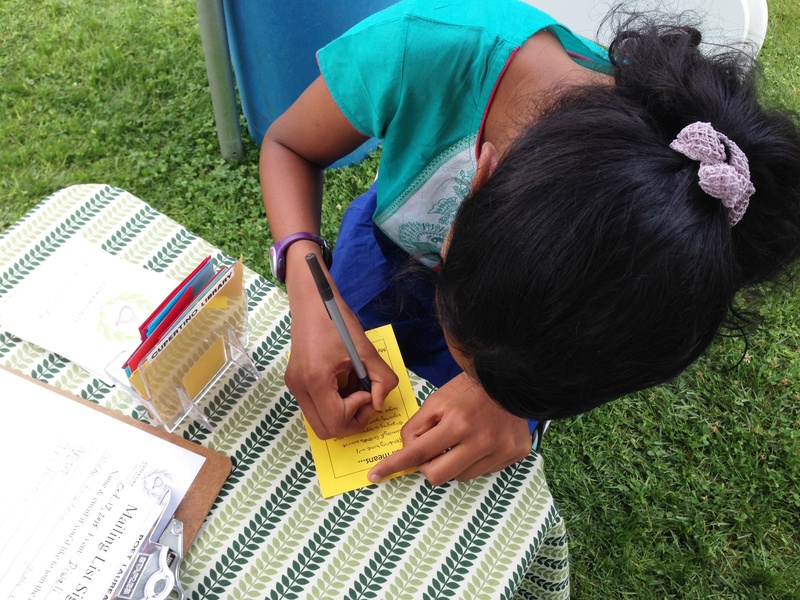 We collected over 60 cards from kids as young as three, teens, and adults, and had a lot of lovely conversations with people about Diwali in the process. 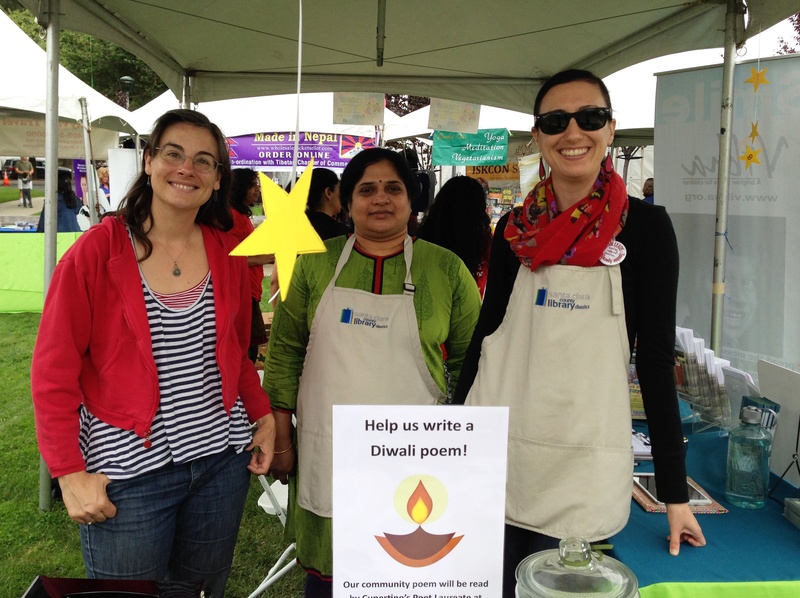 Amanda and I are writing poems from these messages to read at the October 24 Diwali Festival of Lights event at the Cupertino Library. Read those poems at this link and at the library. 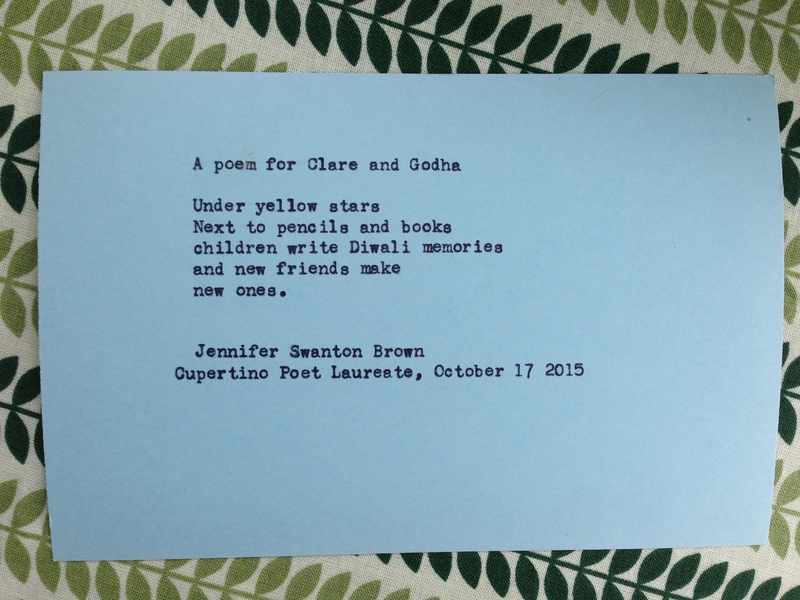 I’m so grateful to Clare and Godha for all their excitement and support. Amanda and I had a blast. What a lovely day it was, in spite of the cool cloudy weather. I certainly understand now why so many people love Diwali. 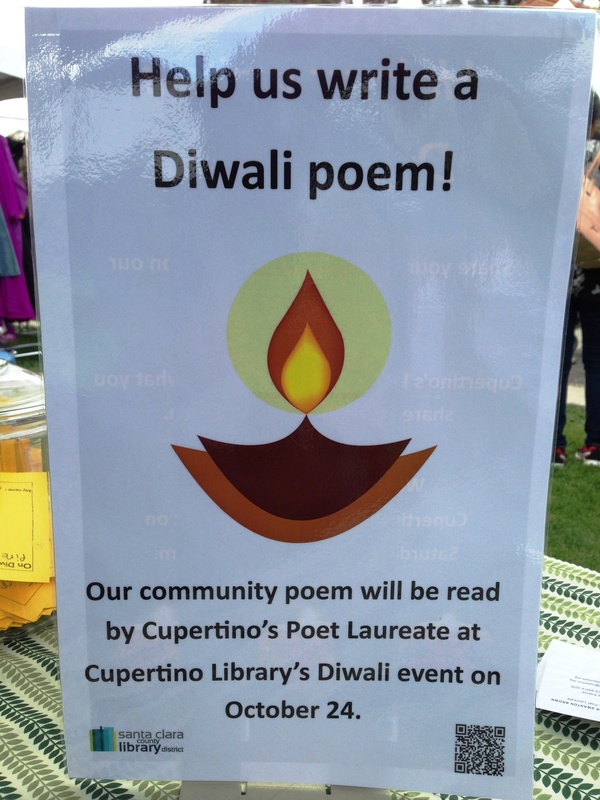 I am especially grateful to Anjali Kausar and Ann Stevenson of the Chamber for arranging the reading, and to Gayathri Kanth, the Cupertino Community Librarian. Ann is also a Cupertino Library Commissioner.